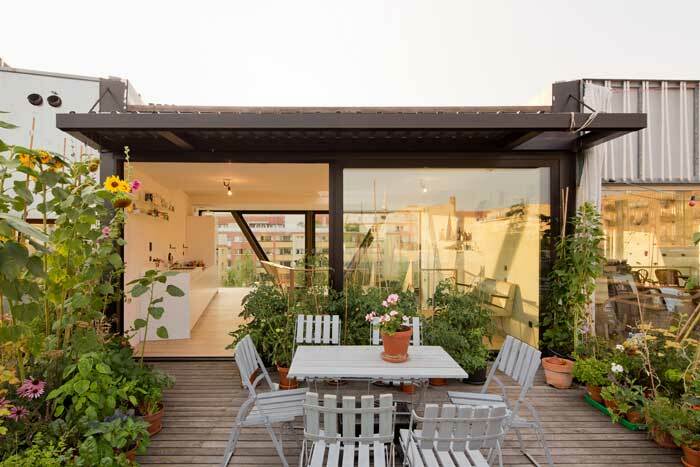 The Z–section of the B14 townhouse in Berlin is an experiment in living. 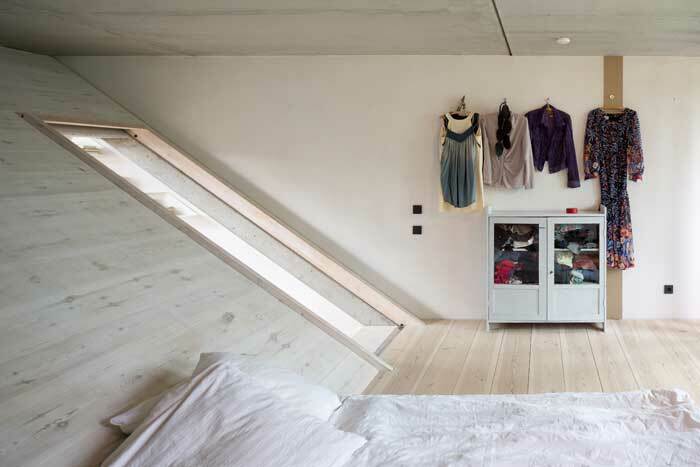 Helle Schröder, of architecture practice XTH-Berlin, designed the house with Martin Janekovic, and describes what it is like to live in. It’s early morning on what is going to be a bright October Sunday, and I’m sitting on the roof terrace with the first coffee, looking across to the TV Tower still half- shrouded in fog, and starting to write about the Berlin house we – my two kids (Liva, 14, and Dan, 12) and I – have been living in for the past two years, and thinking about how special it still is. At my back is the Berlin Wall Memorial; too early for tourists, but in the next couple of hours it’s going to be busy. We live so close to this very public space, but the house still has this funny feeling of privacy and intimacy despite the public being so close. This theme continues throughout the house: our life is a continual juxtaposition of city and village, anonymity and neighbourhood, family life and independence, hospitality and privacy. All of these apparent contradictions underpin our approach to architecture, which is that a house is a platform for living, not a corset. To achieve this, we worked with levels instead of floors, space instead of rooms, and open zones – for multi-layered usage – instead of fixed functions. With this house we had the chance to work with the entire volume (within a given geometry), so we developed it in cross-section, instead of the floorplan, and enjoyed working with 3D models – many of them physical. The outcome is a continuous living space extending over the total height, length and width of the building: from entrance hall and playing/working area to a music level to a living room with an open bath to a reading area to a kitchen with terrace. With the kitchen on the top level we can go straight outside with a coffee in the morning. Since we also designed the two neighbouring houses, we put their kitchens upstairs, like ours. Apart from that, the houses have totally different concepts; and yet they share the same sensibility for architecture as a function of daily life – boat garage, bike workshop, office, climbing wall – a place for living. 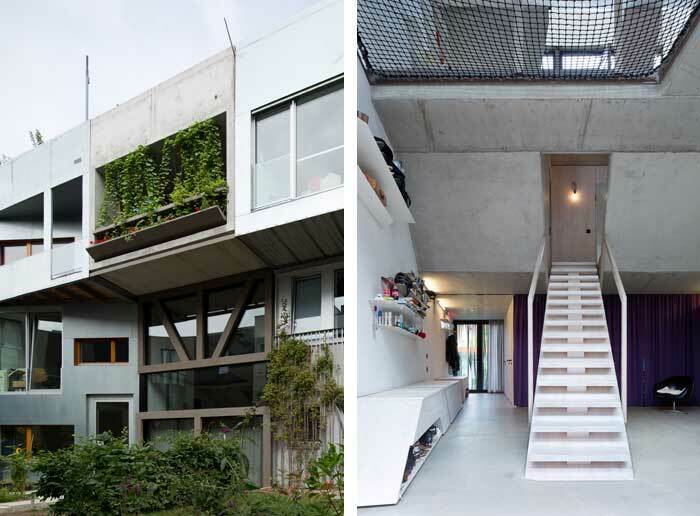 The open house is zoned and separated in cross-section by two concrete ‘rooms’ spanning between boundary firewalls and which contain the bedrooms. 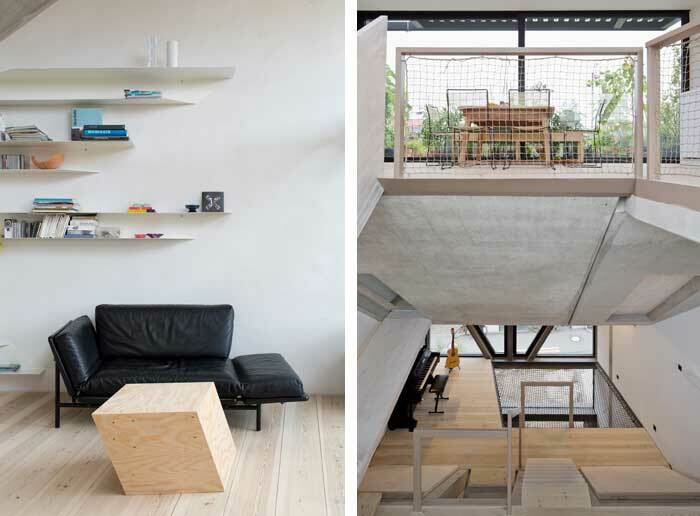 Because each floor is a split level with stairs or ramps leading up and down, there are views through the entire house. Most intriguingly, when you stand on one (split) level you can see out the windows of the floor below and the floor above, with an associated increase in natural light levels. Only a few materials characterise the interior space: fairfaced concrete for the solid elements; plaster for the firewalls; glued-laminate spruce for dividing walls, stairs and doors; and pine planks for the floors, besides steel for the railings, glass for the façades, nets for safety and screens for filtering views and light. We designed some of the interiors, such as the shelves and cupboards, using the 35- degree stair angle, but we have not been dogmatic, allowing for an idiosyncratic collection of domestic furniture. Diagonal lines activate height and movement. I strongly believe that architecture should be fun to create and fun to live in. Even on this historic site. Our place is located in the city centre along the former wall – the no man’s land between East and West, now the Berlin Wall Memorial. It is part of a settlement of 16 townhouses; we got the site on a long-term lease, which is quite unusual but makes affordable city living possible. It was originally to be part of a perimeter block development, but the city then decided to build the wall memorial, which meant the houses were front-row free-standing. That was when we decided to apply for a site. Our site is trapezoid in shape and measures 118 square metres; a small garden in the south-east borders a residential path, and the long profile of the house to the north-west faces the plain of the Berlin Wall Memorial. Because of that, our frontage makes for a rather severe contrast to the colourful balconies on the houses opposite in the former West. The façades, which are almost fully glazed, are supported by steel girders that span the distance from one dividing wall to the other. They also provide the cross-bracing, as there are not enough walls in the house to provide for this. 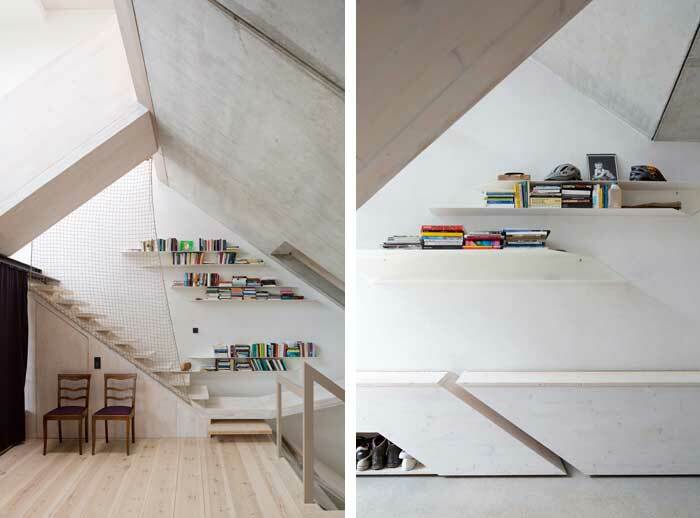 Above all, this house is about space and light. There is a certain luxury in space – and I’m not talking about the square metres – for light floods the interior through the extensive glazing and a huge rooflight. The rooflight lets the midday sun shine right down to the lower levels, and creates a thermal stack effect for maximum ventilation during summer. Roof terrace off kitchen/dining space. Within this house, our experiences are constantly changing; even now, we are discovering beloved places and adapting new spaces. And we can easily share the place, thanks partly to the size (about 230 square metres) but more due to the structure: we don’t feel constricted. I am still proud of what Christian Welzbacher of A10 wrote about our house in a review: ‘free, wild and wonderful’.